My Giclée prints are created from the original painting using high resolution scanning or photography, and with proofs approved by me for colour matching. The painting, and not the digital file of the painting, is then the original, as the proofing is done by comparing the print side-by-side with the original painting. The final Giclée image is generated from archival pigment-based inks and high-precision printers on 100% cotton rag paper. Each print is hand-signed by me, guaranteeing the artist’s approval. I believe that a faithful reproduction of an artwork is of utmost importance for the viewer of the Giclée print, as is the recording of music for the listener, or the unabridged version of a written work for the reader. Within traditional forms of printmaking, such as silkscreen, lithography, etching, or woodcuts, a variety of prints may be made from the same piece. In addition to variables intrinsic to each unique printmaking process, colours can be interchanged and layers may be deleted or added, offering elements of originality to each print. In contrast to these traditional qualities, and in contrast to mass production of prints generated from un-proofed digital files, my goal is to create a Giclée print, as realistically and faithfully as is technically possible, to the colour and clarity of the original artwork. I print on cotton rag paper to produce an artwork in its own right, and with high aesthetic quality, rather than to print on canvas, creating a product that may mimic the original. Because I consider each print an artwork the reproduction process is crucial to the result. 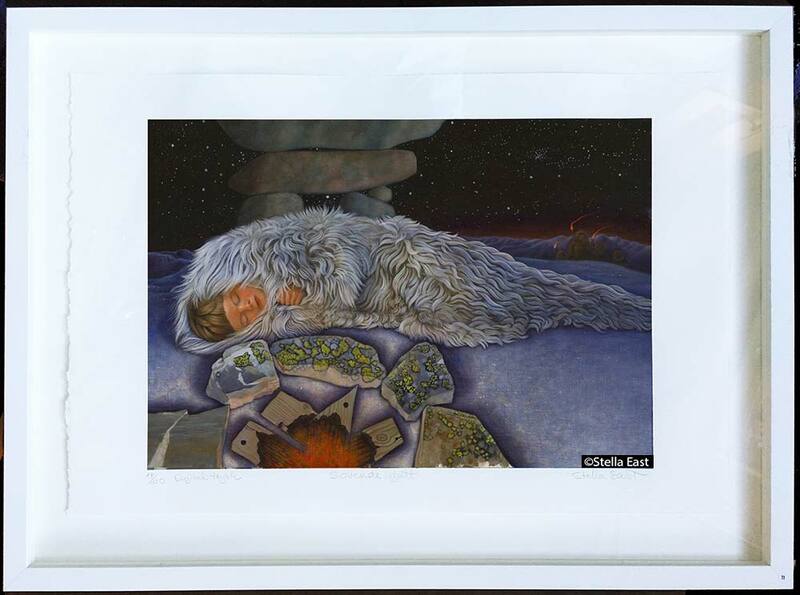 “The Sleeping Boy” mounted in a white box frame: limited edition of 100: hand-signed by the artist: printed on Arches 100% cotton rag paper at Toronto Image Works in Toronto. In 2004 a company contacted me about a revolutionary new business idea: affordable framed, fine art prints for children, sold online. 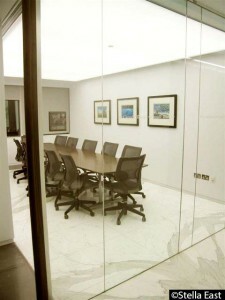 By signing with the company, they could then create “print on demand” high quality Giclée prints. I would receive royalties, and children could enjoy beautiful art. Though I loved the idea, I never became a part of this business. Besides being concerned about signing over my copyright, I was unwilling to lose control over the crucial quality of the reproduction process. Therefore, I chose instead, to embrace this new technology myself, with a plan to reproduce a small selection of paintings as high quality, limited edition, Giclée prints. I would then update my website from 2003 for the presentation and sale of these prints. I explored the possibilities of high quality Giclée reproductions in Norway, but Norway was not ready yet. I chose instead Toronto Image Works in Canada, a business that had been built up and around the Canadian artist and founder Edward Burtynsky and the perfection of the print. Between the years 2005 and 2008 I completed the production of 20 different prints on Arches 100% cotton rag paper. A small number of these prints were sold at exhibitions, from galleries, and from my studio. Eight framed prints were sold to Canadian embassies in Kiev and in Abu Dhabi. Three framed Giclée prints featured in the main boardroom; The Chancery of the Canadian Embassy in Abu Dhabi: “The Inukshuk”, “The Whale”, and “The Departure”. Photo and Interior Design by Karen Large. The idea of an up and running website though, designed to display and sell the prints, had to wait another six years, – until the technology of web design became more accessible, and the right web-designer was found. In 2013 The National Art Gallery of Norway‘s photographer Børre Høstland digitalized over 200 of my paintings with a digital Hasselblad camera. This was the foundation for my future website, allowing the possibility to display high quality and faithfully reproduced images. These photographs also function as a digital base for present and future prints. In 2014 with the excellent help of designer Morten Budeng, I launched my new website. Besides being an arena for selling prints, this website can be seen as an online gallery, allowing my images to circulate and for society to have access to them. The colours, clarity and quality of these web images are of utmost importance, – as is the quality of music and literature presented online. In connection with exhibiting at the Oslo Children’s Book Festival 2016, I produced my 21st print “The Tiger” from the original painting with the same name. “The Tiger” is a limited edition print on 310 gram Canson Cotton Rag paper printed at Studio Technika in Oslo. Studio Technika’s dedication to reproducing an image as close as possible to the intention of the original painting makes them sovereign. The resulting print is amazing. 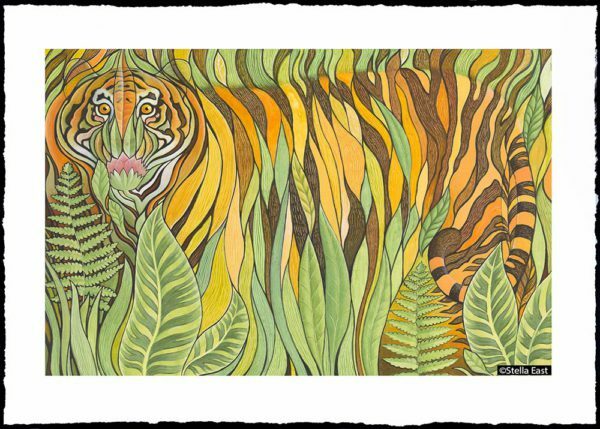 “The Tiger” 50 x 70cm: limited edition of 100; hand-signed by the artist. Printed on 310 gram Canson Cotton Rag paper at Studio Technika in Oslo. Why make Giclée Prints of paintings? In many ways the print is an extension of the finished painting, allowing the intention of the painting to circulate in new ways within society. Each painting may take up to three months to execute, from the first sketches to the finished image on linen Belgian portrait canvas. This process may include planning and reworking the composition, producing the working drawings, using hours of research in libraries, museums, websites, or in other countries, and then meticulously applying the layers of paint. 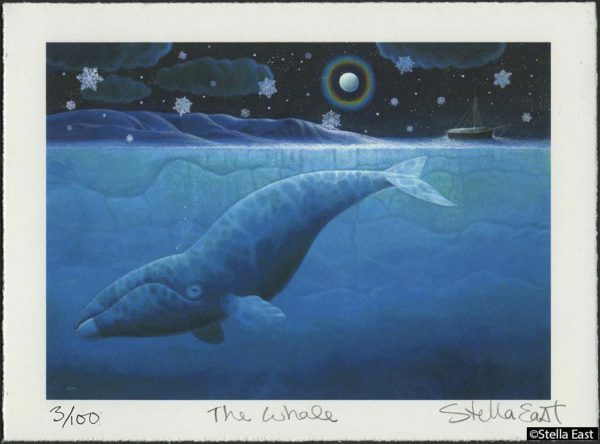 Though most of my paintings have been printed in picturebooks and book covers, they will in time be out of print. Even if the original painting is sold, there is no guarantee that it will be viewed and enjoyed by more than the buyer, as it may not even be displayed privately, or publicly. The Giclée prints, allow viewers to own, share, display and enjoy, affordable pieces of custom printed, hand-signed, limited edition artwork. The quality of a Giclee Print rivals traditional printing processes and is found in museums and galleries around the world. Giclée prints for sale here :-). Categories: Picturebooks, Illustrated Books & Book Covers, and Art in Public and Private Spaces.